This week, Coach Lindland offers an interesting story detailing the qualifying process he had to go through prior to the 2000 Sydney Olympics and translates it into how it syncs up with the situation facing the three remaining US Greco athletes preparing for the 2nd OG Qualifier later this week. In addition, we cover some of the impressive performances from the Junior World Team Trials, which put a spotlight on some of the sport’s future stars. 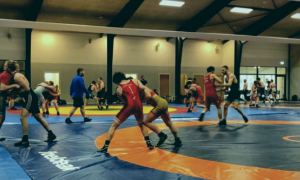 We also pick up on the conversation from last week, which featured topics such as how and why wrestlers should find their way to Greco earlier as well as some of the misconceptions people may have about the process. If you want an insider’s perspective, then this week’s report is required reading. 5PM: When it was you in 2000, your last qualifier was the Pan Ams. Maybe people should understand the differences and difficulty in how qualification was set up back then. The Pan Ams were held during the same time frame as this one (2nd OG World Qualifier in Turkey later this week), correct? Coach Matt Lindland: Yeah, it was about the same time-frame. We had a really strange qualifying process in 2000. They had all the World qualifiers first. I got sent to the first World qualifier but I still wasn’t healed up. I completely tore my arm apart at the World Championships in 1999, beat a World Champion with one arm and then lost to the guy who won the Worlds that year, Avluca, lost to him in the first round. And that was pools. It was a very strange pool system, so you had the ‘98 World Champion in my weight, Baiseitov from Kazakhstan, and then Avluca from Turkey who ended up winning it that year, and I was in that pool. And only one guy got out of that pool. So I ended up losing to Avluca in the first match and I couldn’t figure out why I couldn’t finish that lift. I got up in the stands and asked my wife to massage my arm because it was a pool and I was guaranteed another match like I said, against Baiseitov from Kazakhstan. And she was like, “I’m not touching that arm.” I looked down at it and it was the size of a softball, the muscle had torn apart and rolled up in the middle of my arm. I convinced the doctor to tape it up and I went out there and competed. But without getting a pin in that match there was no way I was getting out of that pool because Avluca beat Baiseitov, as well. So I went to that first World qualifier jut not prepared, not healthy. For the second one, Colorado Springs sent another athlete who didn’t perform very well there. So I ended up going to two more. I took a silver medal in Uzbekistan and I took a gold medal at the qualifier in Egypt. For whatever reason, the way the pools worked they didn’t qualify us. So the last chance was our Pan Ams. I went there and wrestled Filiberto Azcuy from Cuba. I’d say we went back and forth, but he beat me more than I ever beat him. But I got the last two wins over him and chased him down to 69 kilos. Then I ended up wrestling Nestor Almanza, the World Champion for Cuba who was their backup. He was riding the pine (laughs). I remember we had four guys who qualified and we had three here, so it was a very similar situation that we’re going into with this group. Last chance, you know. Multiple weights to qualify. Brandon Paulson qualified, Heath Sims, and then me and Dennis Hall. Dennis competed against a multi-time World medalist, as well, and he got it done. I was the last match and I looked over at Coach (Rob) Hermann and he said, “Damn, I’m so nervous.” (Laughs) But I felt pretty good and ended up beating him (Almanza), qualifying the weight. Every one of us qualified our weights in 2000. But you know, it is what it is. I think everybody is a little nervous, a little stressed out. It’s the same how I was in 2000. At the same time, I was like, Good, let me go get this job done. So I feel good. And I know that’s where my athletes are. Because we all might be nervous as a coaching staff and organization, but I know where their heads are. They’re saying, “Let me go out there and get this done.” Because I’ve talked to them all. And I know that’s the mentality they have. And I know they want to do this and qualify their weights, I do. And that’ll help them perform. Maybe those matches in 2000 when I got sent to the qualifier in Uzbekistan that I didn’t want to go to because I knew the point system was screwy and I wasn’t going to get it done and I wound up taking a silver medal in that tournament. Then I was like, No way am I going to Egypt. That they were going to screw up this process so bad it wouldn’t matter if I win, which I did. (Laughs). I beat a World Champion there, as well, and didn’t qualify the weight. But going into that final qualifier knowing that only one athlete was going to qualify out of our entire continent…I was like, I feel good Let’s go get this done. And that’s where I feel my guys are right now. It’s my time, I gotta go get this done. I could have done it the easy way in Texas. I could’ve gotten through in Mongolia. But you know what, the pressure’s on and I need to perform. I really believe that’s where these guys are at. There’s a lot of pressure on them, but it’s time to perform and they’re going to get it done. 5PM: So your situation in 2000, Uzbekistan, Egypt, those places counted simply as just regular tournaments, international placings? ML: It was a point system. Kevin Bracken missed weight in Egypt. And that was the best thing for him. Because if he stepped on the mat and didn’t place high enough, he would’ve bumped himself out. 5PM: Ooohh, I get it. ML: Yes. The only time in Kevin’s entire life he didn’t make weight it benefited him (laughs). 5PM: So the Greco Juniors wrapped up their Trials last week and they’re with you now in Colorado. ML: Yes. I flew home and had already planned on coming back after Mongolia. I told Coach Momir I’m not going to Turkey unless we have two or three athletes. Well, I’m going to Turkey, so. But I wanted to be out here and see these Juniors. We have a phenomenal Junior team. I got to see the athletes compete. When you’re with certain guys every day like G’Angelo (Tracy) Hancock, I guess you don’t see how much they’ve improved until you watch them step on the mat at the same level. Like last year, he made the team but he was out of position and getting scored on. This tournament was night and day. It was a different athlete out there competing. He’s made such huge improvements in our room every day for an entire year at the Olympic Training Center training with the top guys, going overseas, and competing internationally all year. And it’s not just on the Junior level, it’s on the Senior level, as well. He’s winning matches at the international level. Not just the fact that he made our National team this year, he’s winning international matches at both the Junior and Senior levels. So to see him compete against other Juniors last year and this year, it’s like watching a different athlete. But we’ve got a lot of great athletes on this team. We selected a really great team here and I have four of them out here this week, we had some time scheduled. Some of the other Juniors are still at school, or whatever their situation is. But we have two guys who are returning World Team members from Northern Michigan plus we added another athlete, so that’s three athletes from Northern Michigan on the team. We’ve got two, Kamal and G’Angelo, who train here in Colorado. I’ll tell you another athlete who really looked phenomenal is Taylor LaMont. 5PM: Oh yeah, I saw that. ML: Huge improvements. Two falls in the finals against Mitch McKee. ML: Yeah, and McKee’s a phenomenal Greco wrestler, too. Jamal DeArmond is the other one from Northern Michigan. I don’t think he was ever a high school state placer or anything. He came to Northern Michigan with not very many credentials and in a year, getting to see him progress, as well. But my big surprise was G’Angelo, because I’m around him every day, I know he’s getting better, but then you get a chance to see him compete at that level and it was incredible. Jacobi Jones, who also trains with us here, won it at 79, but that was a non-World weight. The big surprise of the tournament I think for me was Nick Reenan and Wyatt Koelling. Both phenomenal wrestlers. Nick is probably a little more folkstyle/freestyle, but he does a lot of Greco when he’s out here in Colorado and I’ve gotten a chance to work with him over the last couple of years. Just a tough, hard-nosed athlete. But Wyatt is an incredible Greco wrestler too, so that was a little bit of a shock. Mike Rogers, just got to meet him. I wasn’t real familiar with him in the past. Nick Boykin was a Cadet in the finals with him. Pinned his way to the finals. The problem was Cadet doesn’t have anything over 100 kilos and Nick’s walking around at about 120. You know, for 16 years old he looked terrific out there at the Junior level. But really, he hasn’t had a lot of Greco experience. I brought him out to Colorado for a week, his plan is to relocate out here once he finishes his senior year of high school, do the Kyle Snyder route. But Nick was a really big surprise. He’s somebody I looked at and said, “This kid’s an athlete.” He hasn’t been coached a lot, he hasn’t spent a lot of time doing Greco and I know if we can work with him I can see his abilities. So I convinced his mom to send him out to the Juniors even though he’s a Cadet just to see where he was at. And I was very surprised and happy to see what he did at that level. I know he was probably disappointed he didn’t win, but just to make it to the finals as a Cadet is impressive as it is. 5PM: Oh, wait until he matures and grows into his body. ML: Oh absolutely. And hey, so was Kyle Snyder. But it took him a full year at the Training Center before he won his Junior title and then another year later he’s winning a Senior World title. You know, I could see that in an athlete like Nick, with his attitude. And the one thing that really impressed me the most was that I taught him a warm-up and a cool-down and he was very disciplined and he did those. But the most impressive thing was how he relaxed he was. He was warm, his body was sweating, but he was relaxed and calm as he stepped out on the mat and wrestled that way, regardless. There was no panicking. And that takes years of development. So to see a 16 year-old athlete display that kind of composure was very impressive. ML: Porter is a very tough athlete. 5PM: Do you think that part of the benefit of being younger and training in Colorado Springs for someone like Kamal is that aside from the coaching and resources, it’s simply the confidence that comes from being in that environment? It’s like, making that kind of move makes a difference in their attitudes as well as their abilities. 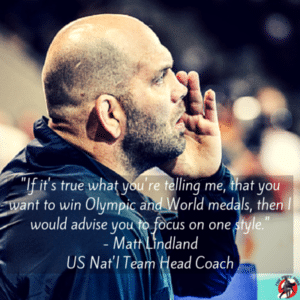 Coach Matt Lindland: Well, we’ve seen it work with Henry Cejudo and Kyle Snyder. It’s that we just haven’t had enough of these young, talented athletes have the confidence, to be able to have that security in themselves to make that leap. We talked about this before. The traditional path is, “Now I’m going to go wrestle in college. But if somebody has that type of ability, I don’t think wrestling in an age-group division is necessarily where they need to be, especially when you can wrestle age-group internationally instead of just domestically your entire career. 5PM: The trajectory narrows it seems just by staying with the traditional route. ML: And the coaches at the college level, their goal isn’t for you to win World medals, it’s to help them win at the NCAA level. They want to see you win All-American statuses and national titles. 5PM: A lot of this stuff got attention last week, and there was agreement from notable Greco clubs that yes, this is the direction the program needs to go in. ML: I’m spreading the message and the message is that our best international athletes need to stick to international wrestling. To forgo the folkstyle route. If that is true of their goals, if their goals are to win World and Olympic medals. If their goals are to win NCAA titles, then that’s the perfect place for them. But the more I talk to athletes and get to know what their dreams and desires are, a lot of them are telling me their ultimate goals are to be Olympic champions. So I want to give them as much information as I can to help steer them in the right direction. 5PM: You mentioned last week how a good portion of these college athletes are actually more suited to wrestle Greco in the first place. People need to recognize and be comfortable with this, the fact that some wrestlers are not very successful at folkstyle yet come alive when wrestling Greco. 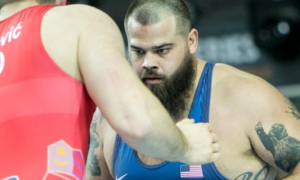 ML: Everybody has that story, “Oh, I used to smoke that guy in folkstyle, but then Greco would come around…” They were relaxed, they were having fun. I think back to when I was in a club, we couldn’t wait for folkstyle season to end so we could go have fun, as we put it. And now that I’m looking back on it, I’m like, why didn’t I just have fun my whole career? (Laughs) Why did I try to do the high school wrestling and the college wrestling when really what I enjoyed were the international styles? I was seeded number one in the NCAA tournament my senior year. I went undefeated that entire season and lost the first match at the tournament. And then a month later I won the University National title with all of the same athletes at my weight, except there were more. It was just the guys who were on the podium at the NCAA’s, plus. And I had never beaten Pat Smith. I never wrestled him outside of Stillwater, either. But I had never beaten him in college. Well, I took him out in the semifinals at the University Nationals and then wound up tech-falling Willie in the finals. That event actually qualified me for the opportunity to go to the Pan American Senior Championships that year and I ended up getting a gold medal there, too. And this is the guy who didn’t place at the NCAA tournament. So I’m speaking from experience and I’m trying to advise the athletes that if they are serious about winning Olympic medals they need to be directed to the right path – instead of seeing them waste their time doing something they don’t enjoy, something that is just pressure and is not fun. Because wrestling is a hard sport, it is very difficult, I don’t care what style. It’s all difficult. And if you’re not enjoying it, not having fun, and not just loving the process, you need to find something else to do. I’ve seen these kids, they’ll place at Fargo, Cadet, Junior National championships, World Team Trials, and they didn’t even place at their high school state tournaments. Because what they were doing was not fun for them. 5PM: Well, that’s a tragedy. 5PM: Your first fight was in February of that year, right? ML: Yeah, I fought in an open-weight tournament that year and then I fought two more times about a month later in another tournament in North Dakota. It was cold, it was springtime and like 30 degrees and we fought outside (laughs). These were incredible opportunities, to get those fights. This was something I knew I wanted to pursue, but I also knew that if I didn’t specialize in Greco Roman, there was no way I was going to get my medals in the Olympics and the World Championships. So if you look at my record there on the Fight Finder, you’ll see that I fought in ‘97 and not again until after the Olympic Games in Sydney. Because I knew, I knew I needed to focus on one style and put all of my efforts and energies into that, and then I could go and pursue something else. But I wasn’t going to do that until after I achieved my goals in wrestling. And I wanted to win a gold medal, for sure. I came very close and I’m satisfied with my results because I gave everything and put everything into that. I didn’t split my time and my effort, you know, training in martial arts while trying to wrestle Greco. I think that goes the same for international wrestling versus college wrestling. I mean, if your goals are this, you need to follow that path. And if your goals are NCAA titles, then follow that path. But if it’s true what you’re telling me, that you want to win Olympic and World medals, then I would advise you to focus on one style. 5PM: If you were, I don’t know, “President of the World” or something, would you be in favor of eliminating folkstyle altogether? We’re talking, even at the school level, high school, whatever, they’re wrestling freestyle and Greco matches. Would you be in favor of that? ML: (Laughs) Yeah, if I could just throw down the gauntlet and say, “This is how we’re wrestling”, then yeah. I think we’ve got enough athletes in this country to do both Greco and freestyle. I look around in the room and Mark Hall’s in there, he’s wrestling Greco with our guys today but he’s a freestyle wrestler. He just is. He’s a phenomenal freestyle wrestler. And I could probably convert him if he wanted to do it, but he loves freestyle. So I don’t know why he’s going to Penn State (laughs). Because he is really good. I could see him doing “a Kyle Snyder”, training in freestyle and winning another Junior World title and then moving up as soon as Jordan retires. Or you know, let Jordan get a couple more years older and maybe he’ll be taking him out, too. But yeah, I definitely see it in our room, there’s guys who are freestyle wrestlers and there are guys who are Greco wrestlers. I think that a third style just puts us further behind in the development of our Senior athletes, for sure. 5PM: Well, it just seems that people who are so pro-folkstyle tie it into schooling and it is so associated with getting degrees and moving on in life. ML: Cejudo got his school paid for, his undergrad, and now he’s starting a graduate program and it’s entirely paid for because he accomplished what he accomplished in wrestling. And he didn’t go to a wrestling college, so they offered him a free education. The “Living the Dream Fund” is offering $250,000 and you could pay for a lot of schooling with that. I think it’s a myth. The 9.9 scholarships they spread across 40 athletes on a roster, there’s not a whole lot of school getting paid for, to tell you the truth. ML: It can’t. I worked at the college level, I saw what athletes were getting. Some would get books, some paid room and board, some paid full-tuition but had to come up with their own room and board. There are very few full-ride scholarships out there in the sport of wrestling. 5PM: That’s why what you said last week was very important. These athletes should know that they could go Greco younger if they want to. The same level of opportunity is there, they just have to seek it out a little bit, it’s there. It’s almost as if it weren’t for someone like you, that information would be hidden from them. ML: Because the college coaches aren’t going to tell you that. Your high school coaches don’t know it. Maybe some of your club coaches might know that and if they do, they’re going to share that information with the athletes. But it’s going to have be one athlete at a time until we get some critical mass and see more of these athletes. The athletes we’re talking about who have done this, it’s not a very long list. It’s Henry Cejudo, it’s Kyle Snyder…who else? Who else has made that kind of move? And even Kyle went back and wrestled a college season. 5PM: Okay, so you’re heading out Wednesday morning and then rejoining the guys in Turkey? ML: Yes, I leave Wednesday morning. 5PM: What is the next step for the Seniors following Turkey? ML: The guys who are competing will have next week off. Andy and Robby are still in Europe. They have separate plans. Andy’s in Austria and Robby’s in Hungary getting in some training. So when I get back on Sunday I’ll be resting the guys who competed in Istanbul and hopefully they will be celebrating qualifying their weights. And then on Wednesday we’ll be traveling to Concord, California for training camp out there. We’ll be working with some Juniors and there will be Team Hungary, Team Sweden, and the Norwegian team will be out there, as well. So the Juniors who will be traveling out there will be getting some really good training with international partners. Andy’s got Beat the Streets on May 19th and they booked him a match with Kim from Korea, a World and Olympic champ for him to wrestle. So Andy is going to get a chance to showcase himself at Beat the Streets. Robby is going to be the emcee for the event, so we’ll have two Greco athletes participating – one as a competitor and the other as the master of ceremonies. 5PM: Now when you get back, you still have the camp going on, is that right? Coach Matt Lindland: Yup, I get back in Sunday night and then we got another week of camp. Thursday and Friday there are some other coaches in town. I got some great guys. I got Chris Saba, who was just recommended by the Coaches Selection Committee to the Executive Committee to be an Olympic Team coach. He’s in town so he’ll be in the room. Herb House will be in the room, TC Dantzler, Olympian, Spenser Mango will be in the room, Coach Kleuver from Wisconsin, Lucas Steldt from the Combat Wrestling Club in Wisconsin. So I’ll have a lot of coaches in the room the athletes will get a chance to work with and they’re great coaches, too. And then I’ll be back on Monday.